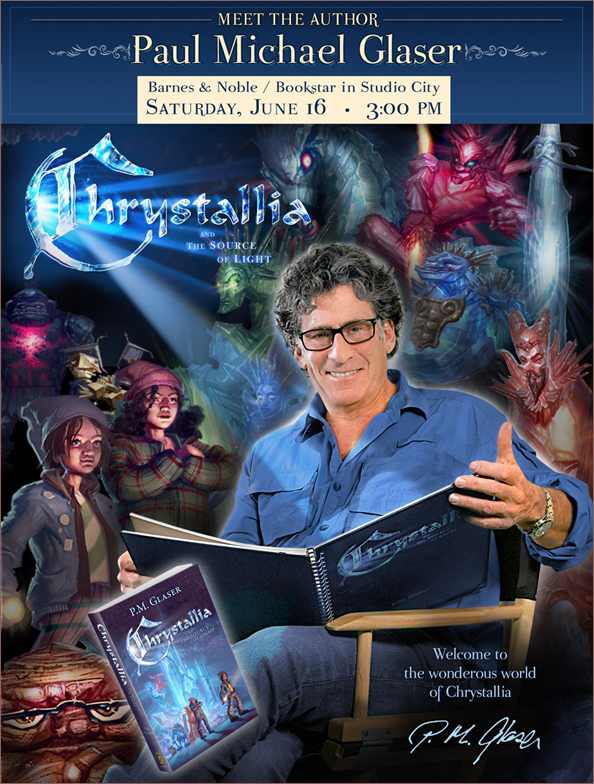 Peter Green Design is pleased to have played a major role in helping to launch Paul Michael Glaser’s new fantasy novel, Chrystallia and the Source of Light. For the past two years, PGD has worked with Paul on everything from marketing materials to book publishing to website production and we are now preparing the launch into his next phase; Paul will be taking his novel on a nationwide press tour. This will be followed shortly after with plans for turning Chrystallia into a feature film. Below is a poster from one of Paul’s many in-store readings that he has embarked upon. He will be at Barnes & Noble in Studio City this Saturday at 3PM. You can order a copy of his inspiring book here: chrystallia.com. Copyright © 2014 Peter Green Design Studios, Inc. All rights reserved.